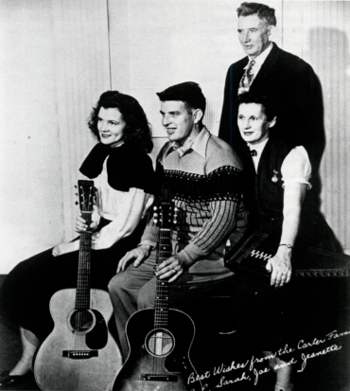 If you were tuned to WBT Charlotte at six a.m. in 1941, you heard the last radio broadcasts of the famous Carter Family trio of A. P., Sara, and Maybelle and the Carter children: Joe, Janette, Gladys, and June. The Carter Family lived in Maces Spring, Virginia, a tiny mountain hamlet near Bristol and Kingsport, Tennessee. Cousins Sara and Maybelle Addington married brothers A. P. and Ezra Carter, and in the mid-1920s A. P. (which stood for Alvin Pleasant), Sara, and Maybelle began singing together as the Carter Family. In August 1927 an RCA Victor field recording team visited Bristol and captured on wax the Carters’ mix of old mountain ballads and original tunes. Their 78s quickly found favor with rural listeners, selling well throughout the United States, Canada and Australia during the years between the wars. Three Carter recording sessions took place in Charlotte. The first two were arranged by RCA Victor in May of 1931; the final session was undertaken in June of 1938 for Decca Records. Twenty-nine sides were recorded in all. The year 1938 proved to be especially successful for the Carters. They were hired by Consolidated Drug Trade Products—the Chicago-based maker of Peruna tonic, Kolorbak hair dye, and Radio Girl perfume—and sent to Texas where they broadcast daily over high-wattage border radio stations just inside Mexico. The border stations reached much of North America and introduced the Carters to hundreds of thousands of new fans. When not broadcasting on border radio, Consolidated Drug brought the Carter Family back to powerful 50,000-watt WBT in Charlotte. A Charlotte Observer radio listing for June 1939 indicates that the Carters were then broadcasting a “farm time” show with announcer Grady Cole each weekday morning, and a second half-hour program every afternoon. This schedule seems to have continued into early 1940 when the family returned to Texas for more broadcasts and transcriptions. Historians report that the family returned to Charlotte in late 1941 or early 1942 for a final six months of work for WBT. It was here that A. P. and Sara parted company bringing an end to the famed trio. In their decade and a half together, the Carter Family earned the right to be called legendary. More than any other group, they brought the time-honored mountain ballad tradition to records. They composed or popularized the now-classic Will the Circle Be Unbroken, Wildwood Flower, Hello Stranger, Keep On the Sunny Side, Let the Church Roll On, Angel Band, My Old Cottage Home, It Takes a Worried Man, I’m Thinking Tonight of My Blue Eyes, and dozens more. Sara helped bring the autoharp into favor as a concert instrument. Maybelle’s innovative accompaniment methods are considered the bedrock of country guitar playing. In 1970 the Carter Family became the first group elected to the Country Music Hall of Fame. The three original Carters have passed away, but the clan continues to be quite active in music. Perhaps best known in 1985 are daughter June Carter, the Nashville singer married to Johnny Cash, and granddaughter Carlene Carter, a top-selling rock vocalist. 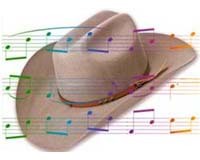 But the favorites of traditional music fans are undoubtedly Joe and Janette Carter. The youngest children of Sara and A. P., Joe and Janette Carter continue to present the classic Carter Family material in its original, unvarnished acoustic form. Janette Carter was born in 1923 and Joe in 1927. Janette learned autoharp from her mother and at age twelve began appearing with the Family. By the late 1930s she and Joe were regularly adding their voices to the Carter Family broadcasts on border radio and over WBT. Along the way she helped her father gather traditional tunes from rural singers. A. P. would write down the words and Janette would commit the tunes to memory. “She was my tape recorder,” A. P. is quoted as saying proudly. Today Joe plays fiddle, banjo, and piano as well as guitar, and composes hymns. Janette plays autoharp and guitar, and has written her own songs in the old Carter style. Her uncompromising rough-hewn singing style is heard regularly in concerts across the United States, among them a recent pair of appearances on public radio’s popular Prairie Home Companion. In 1974, in an effort to encourage the continuance of old-time music traditions Janette reopened A. P.’s general store as the Carter Family Fold, a museum and performance center. Today its simple stage attracts pilgrims from around the world who come to hear old-time acoustic music in the Carter Family tradition. This summer the state of Virginia honored Janette Carter with a Governor’s Award for the Arts honoring her efforts to keep alive the folk music heritage of the southern mountains. Joe and Janette Carter died in the 2000s but the Carter Family legacy is as lively in the 2010s as it was in 1985. Janette’s son Dale Jett and Maybelle’s grandson John Carter Cash have a band The Carter Family III, and Maybelle’s granddaughter Rosanne Cash won notice for including Carter Family material in her 2009 album The List. Family members continue to open the Carter Fold in Virginia to old-time and bluegrass performers each Saturday night. All of the original Carter Family’s recordings, including their 1931 and 1938 Charlotte sides, were re-issued in a 10-CD two-volume set by JSP Records of England in the mid 2000s. Don’t miss the insightful and beautifully written biography Will You Miss Me When I’m Gone? The Carter Family and Their Legacy in American Music (Simon & Schuster, 2002) by Mark Zwonitzer with Charles Hirshberg.